Good so see an economical house built on a very tight buget, that's still great to live in. The first thing to know about the house Urs Peter Flueckiger built is that he did it for the startlingly low price of $51 a square foot, $50.87 to be exact, by using the kind of bulk metal siding usually associated with airplane hangars and toolsheds. The second thing to know is where he did it: here in the high plains of West Texas, one of the flattest, starkest, most sun-seared places on earth. As you might guess, Flueckiger (pronounced FLOO-kigger) is not a good old Texas name. Mr. Flueckiger — known as Upe (OO-pay) — comes from the Swiss Alps, about as topographically opposite the high plains as one could imagine. He arrived in Lubbock by way of Lugano, where he worked with the architect Mario Botta; Manhattan, where he worked as an architect for David Rockwell; and Blacksburg, Va., where he earned a master's degree in architecture at Virginia Tech. Lubbock, like everyplace else, was growing suburbs. New home construction was pushing the city west. The Flueckigers preferred Tech Terrace, an 80-year-old neighborhood opposite the university where houses generally sell for $50,000 to $300,000 in a menagerie of styles. They considered moving into an existing home or renovating one, but then Ms. Flueckiger basically said, You're an architect — design something. Mr. Flueckiger first designed a two-story house with a wall of windows and 15 skylights. 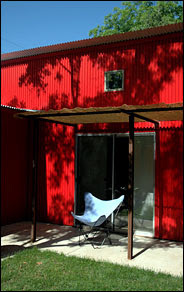 He and his wife — who has long experimented with color and texture in her own work — chose to paint the cladding red because it contrasts, rather than competing, with sky and grass. I really like this place. 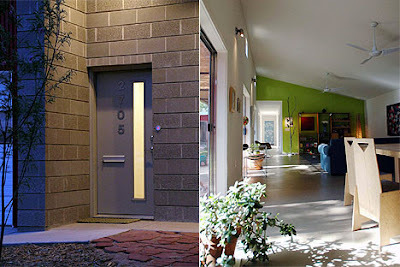 Every time I see it, I think "it can be done" - hip and unique, yet affordable, family home. Too cool.